Venue: Cougar Park, Keighley Date: Sunday, 31 March Kick-off: 14:45 BST Coverage:Live streaming on the BBC Sport website, app and connected TVs. 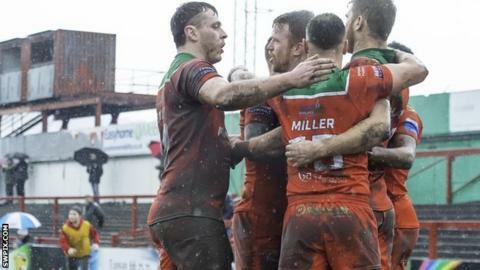 Keighley Cougars coach Craig Lingard has said his side "have nothing to lose" in Sunday's Challenge Cup fourth-round tie against local rivals Bradford Bulls. Both sides have recently endured difficult periods off the field; Bradford were liquidated in 2017, while Keighley were placed in special measures in November 2018 and started the season with a 12-point deduction. Lingard told BBC Radio Leeds: "They're basically a full-time Championship team and we're little old Keighley who are part-time and a phoenix from the flames. "It's got a great cup-tie story to it and we need to be saying that to our players. Let's have a go at it." He added: "We'll need to play better than we did on Sunday (a 24-22 win over North Wales Crusaders) or they'll take us to the cleaners." Sunday's win moved the Cougars on to minus seven points, seven points behind West Wales Raiders and North Wales Crusaders at the bottom of League One. The Bulls have had a mixed start in the league, with four wins and four defeats from their first eight Championship games. Coach John Kear has twice tasted success in the Challenge Cup, with Sheffield Eagles in 1999 and Hull FC in 2005. He believes his side go into the game in good form after their 26-12 win over Leigh last Sunday. "The players got what they deserved. I was emotional after the game because the players did it tough and when you see people you care about doing that it's good to see. It's why you're in sport," he said. "We know we are a good team and will develop into a very good team over the course of the year. I think it was the best win since I have been here."